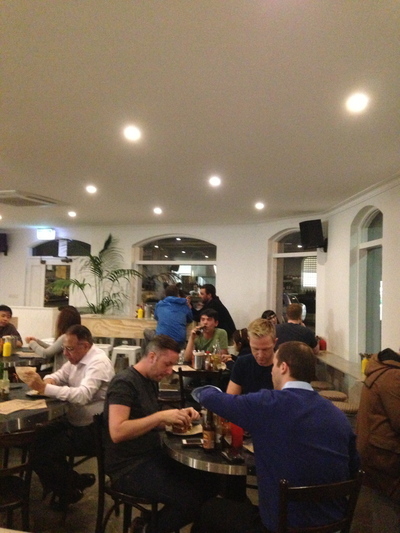 Burger joints in Sydney are taking on a vengeance, and Chur Burger at Sydney's Surry Hills (in Albion Street to be precise) is no exception. No different to the emergence of chilli chocolate, Mexican fiestas, and Fro-Yo's sizzling us Sydney siders all round. Even the chefs themselves open up trendy, fancy burger joints, because quite frankly "they just love to eat em." 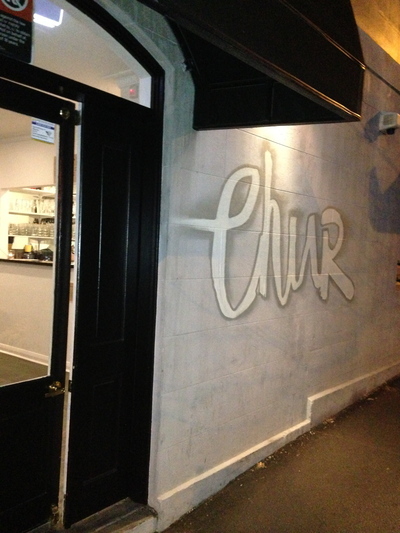 After having a eat in $10 burger at newly opened Chur Burger, you may agree. If eating in with a party of two or more people, you're advised up front to order at the same time, and that way your meals will arrive at the same time. Ah, the art of togetherness. So social. Make it how you want. A fancy fast food diner without the fast food feeling. Once you have a burger here (so dead serious), you won't want to eat at a traditional 'hamburger' joint anymore. Well, not in a long time anyway. Gourmet burgers definitely reign supreme here. 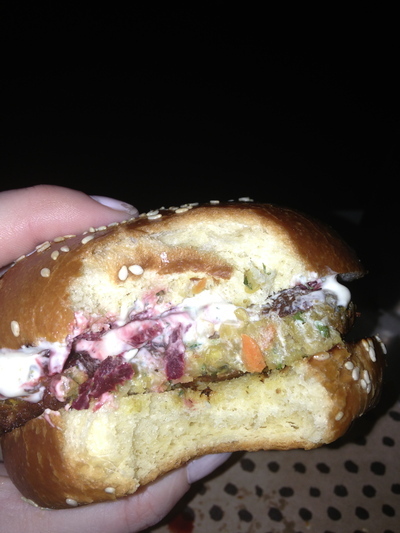 Ordered the spiced chickpea fritter burger with grated beetroot and honey labne, and wow, the lentil flavour was so up there. So off the charts. Vegetarians heaven. No tinned canned beetroot fare here either. This is the real, raw deal. Sliced just mighty fine. So unconventional. Hey, if you happen to be a rather unconventional person, and you're into the "them's the breaks" kind of attitude, you're definitely home and hosed here. Furthermore, you do not even need to be a Surry Hills local to live it up in simple, home renovation feel style, with trendy music and noise without being overly noisy. You're only a close 2-5 minute walk to Central Train station. Live like a Surry Hills local here, yet you don't need to become one, unless you really want to, if you aren't already. As much sauce as you want. Impressed with the choices. Friendly staff. 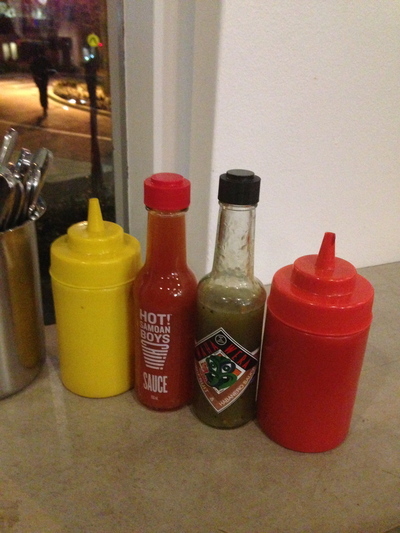 Everything's a pleasure, and help yourself to as much sauce as you want, and even on your American style chips. 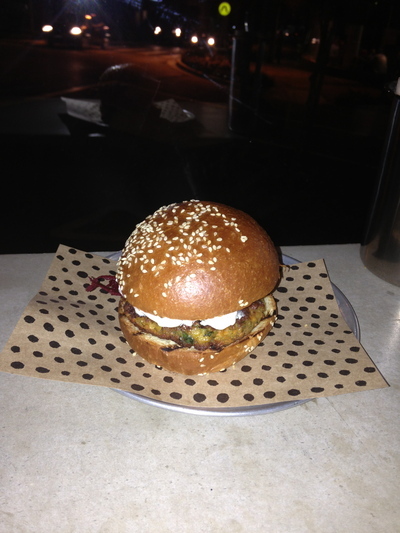 The brioche, French feel bun was just stunning. It was handy to use a fork for some of the beetroot paradise. Only qualm - their body language did not match the rhythm of my mouth at the finale. Why? A staff member asked me (immediately) how my burger was, and took my plate away while I was devouring my last mouthfuls of chickpea. Not good taste there (sorry, terrible pun), yet otherwise the care factor of the staff is up there with small, yet "they fill the spot" kind of burgers. Sides, desserts, snacks and milkshakes are also available. Right on. Itching to explore further. 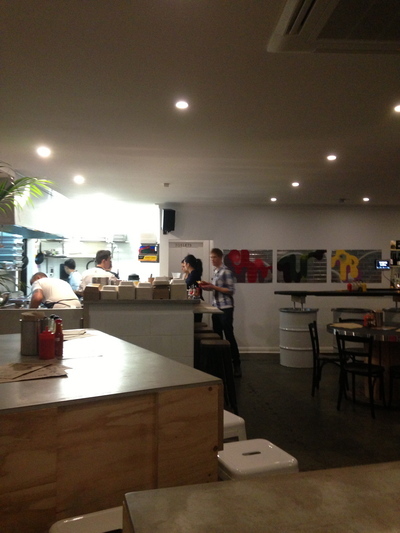 Where: Chur Burger, Surry Hills. 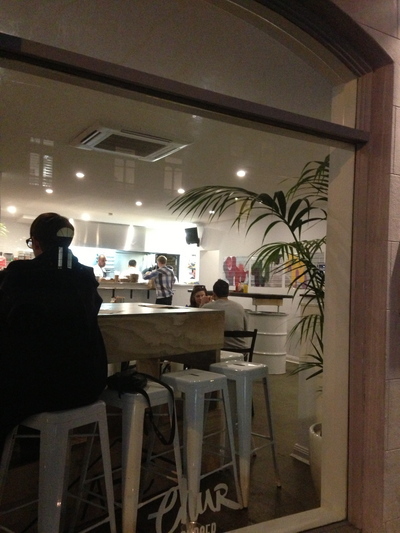 48 Albion Street, Surry Hills NSW. Why: For a healthy vegetarian burger. Cost: $10 for each burger. When: Dinner time. Tuesday night is ideal. Take away: Yes. Part of the fun is eating in though.